With machine translation back and forth translating is a simple game for searching funny translation mistakes. While it is a great way to have some fun, back translation is also often used for quality verification for both machine and human translations. There are some points behind this habit: it is a simple and easy way for translation project managers to control and monitor the translation work when they don’t understand the target language. Nonetheless, the unfortunate fact is that it actually tells very little about the translation quality. Back translating means that first the original text (in language A) is translated to another language (language B) and after that the translation (in language B) is translated back to the original language (language A). Quickly thinking this may seem a good way to see how good the translation is. The common perception is that a correct translation should be exactly the same as the original text but only written with a different language. In reality, it’s not that simple. Every good translation takes cultural aspects into account in a way that the tone and style of the original text corresponds the lingual environment of the target country. When the cultural and lingual differences are correctly adapted into the translated text back translation doesn’t work as an universal quality indicator. This applies to all translations whether made by a human or by a machine. The basic principle with any translation project is that the source text should be written correctly. Text with many spelling mistakes and grammatical errors won’t translate well with a machine. This shouldn’t be a surprise. Even professional translators struggle with the dilemma of how to handle with bad original texts. Although they will probably understand what the writer is trying to say even if the text has some errors, it’s not their job to rewrite the text. If not explicitly agreed on, most professionals won’t fix the mistakes because they might as well be a conscious choice of style. Machine translators don’t understand the text like humans do. They aren’t able to evaluate the original text and its messages. Although machine translation quality is improving with giant leaps, the truth is that it is still rarely totally flawless. Machine translation is able to deliver the main idea of a well-written, foreign text but only translation professionals can produce highest translation quality — providing that the original text is in order. 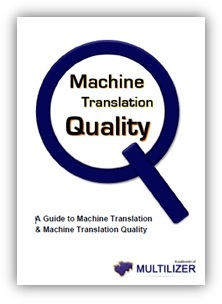 The fact that machine translation is rather good enough than perfect is the reason why raw machine translation is not suitable as source material for further translation. If the translated text has some mistakes the back translation will have even more mistakes when compared to the original text. The message may still be the same but the text will be different. All this undermines the basic idea behind back translating. Translation quality is not as simple concept as it may seem to be. Quality is never given. We can affect how good quality we’ll get when using automatic translation. Download free ebook now to learn all this and more. Next Next post: Can I Print Only Selected Parts in PDF Files?